Bothell Kenmore Chamber of Commerce! Since 2012 we have proudly represented two cities - Bothell and Kenmore - and we excitedly announce our new brand to properly reflect our representation and support of both cities. We are now officially the Bothell Kenmore Chamber of Commerce! Naturally we have a new logo and it represents a fresh and modern visual identity. The color blue represents the stability and continuity of the Chamber, and the color green represents the second city, and growth and vitality of our community. The blue and green waves represent the tree-lined Burke-Gilman Trail and the Sammamish River that run parallel to one another, connect our two cities, and are such an integral part of our community. We will also be unveiling our new website soon so keep your eyes out for that as well. We invite all Bothell and Kenmore area businesses and professionals to Join the Chamber, experience the benefits, add your voice to legislative influence, and show that you support other businesses and your community through involvement with the Chamber. A project management consulting company offering short term or ongoing support in operations, human resources, and events. Taking pride in serving all your printing needs for over 32 years. From business cards to invoices, stationary or t-shirts, their customer service is waiting to assist you with any printing project you may have. Logan's goal is to help individuals with their finances. He creates a personalized plan to help them reach their long term financial goals, and keep them on track for the rest of their life. A group of highly trained, experienced animal lovers who are devoted to giving their patients the best care possible, and treating every patient as if they were their own pet. Join 65-80 other professionals and civic leaders to connect and socialize, hear updates from the cities of Bothell and Kenmore, and the Chamber, meet new members, and find out what is happening around your community. New members will have the opportunity to introduce themselves and their business to the room. Register now for our July Chamber Luncheon event. You will have the opportunity to network, market your business, and hear from an informational speaker while enjoying a delicious lunch. Topic: "Buying Signals: Converting Casual Conversations Into Sales"
This event is open to Chamber Members and non-members. Guests are invited to attend up to three events prior to becoming a member. Big Thank You's To Everyone Who Came To Our Community Open House Event! We had a great time meeting so many wonderful people in our community at our 14th Annual Community Open House. People ate, drank, played games, won prizes, met new friends, listened to fun party music, and discovered lots of new local businesses! We're so proud of all our business vendors who displayed such fabulous tables! This event keeps getting bigger and better every year because of you! Special thanks go out to our Event Sponsor: Banner Bank, our Host Cascadia College, and to all our amazing volunteers and Ambassadors! Do you know someone looking for a summer job? Do you know someone who would rather be in the great outdoors than stuck inside folding T-shirts? The City is hiring seasonals for their Parks & Recreation and Public Works departments. This is a fantastic opportunity for anyone looking to build their skills, professional resume and connect with their community! No experience? No worries - they will train you. Students, retirees, teachers on summer break, there is something for everyone to do. Pay is $14 - $17 an hour. Please visit www.bothellwa.gov/jobs to apply. The 2018 Special Olympics Is Coming To Kenmore! Volunteer For Special Olympics! Want to be a part of this unique experience? Sign up here to volunteer! Parking is available at the First Romanian Pentecostal Church, 8315 NE 155th St. The neighborhood had a vision for the park and prepared a park master plan with city staff in 2006. The school district, Little League coaches, families, elected officials and city staff continued to work together towards this vision. In 2016, the neighborhood and city staff updated the master plan and design and now renovations are mostly complete! The ballfields will be available for reservation through the City of Kenmore in early 2019. Big News! Cast Your Votes To Name Bothell As Nicest Place In America In Reader's Digest Magazine Contest! Huge Congratulations to Bothell for being named a Finalist in the 2018 Top Ten "Nicest Places In America" contest by Reader's Digest Magazine. The winning city will be featured on "Good Morning America" and the Cover of Reader's Digest! The Country Village Shops are busy planning & hosting their many 2018 events! Here's a sample of what they've planned so far! Hot Rods, Hot Dogs, and Motorcycles! 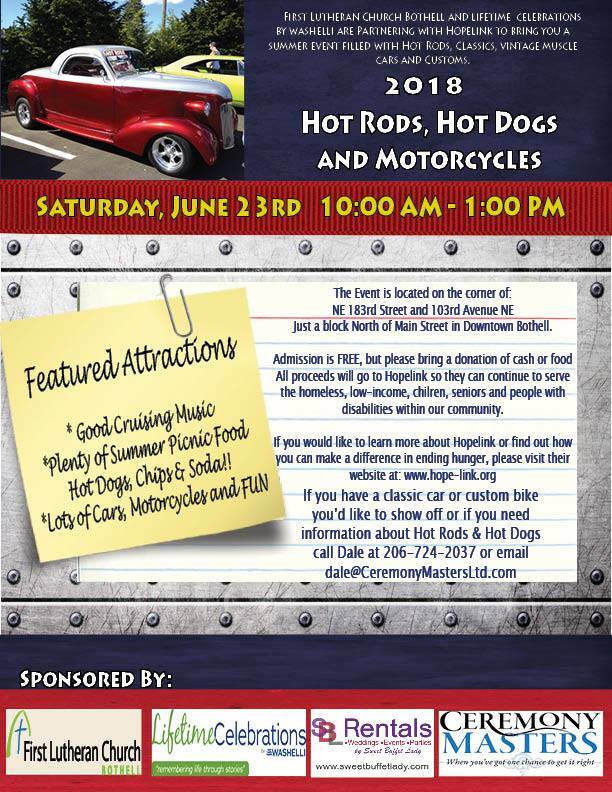 Come enjoy Hot Rods, Hot Dogs and Motorcycles in downtown Bothell Saturday June 23! Cruising music, picnic food, and help for Hopelink makes this event a winner! This event is free but please bring cash or a food donation, all proceeds go to Hopelink so they can continue to serve the homeless, low-income, children, seniors, and people with disabilities in our community. Hosted at Lifetime Celebrations by Washelli. Cairn Brewing is co-hosting the 3rd Annual Boxers & Brews fundraising event to benefit MustLuvBoxers Rescue! They're releasing the Tail Wagger, their India Pale Lager - a refreshing and sessionable beer as summer gets started right. Boxers & Brews is a dog- and family-friendly event, even including face painting for the littles, raffles, and the food truck Alaskan Dumplings. And, Cairn will donate $1 for every pint sold during the event to MustLuvBoxers Rescue. Come support a great community group committed to caring for Boxers in need. Cheers! THE SOLUTION IS ... IN OUR HANDS! What must be done ... now! Come hear Ranger Susan Dearn-Tarpley, City of Edmonds Ranger Naturalist, and Marine Resource Committee present at the Northshore Senior Center on this important environmental topic. Free event. For more information contact Patricia 425-487-3458. Chamber members are invited to a special outdoor "block party" at John L. Scott Woodinville. Head on over on Thursday after work to enjoy a BBQ, wine, beer and soft drinks as well as live music. Hosted by: John L. Scott, Woodinville, Homeward Pet Adoption Center and Pony Express. Local 4th Of July Events & Fun! Reminder: Beardslee Boulevard will be closed to all westbound traffic from NE 185th Street to 110th Ave NE starting Tuesday, June 19 for paving and reconstruction. This will be in effect 24 hours/day, seven days/week through mid-August, depending on weather. * Beardslee Boulevard will be limited to one way, eastbound traffic from about the Downtown Fire Station to 110th Avenue NE (the northern entrance to the University of Washington Bothell and Cascadia College). * Westbound traffic will be detoured on I-405 south and SR 522 west. * No street parking will be available within the project limits (the Downtown Fire Station at NE 185th Street to 110th Avenue NE). * Variable message signs will be placed at several locations north of the UW Bothell/Cascadia College campus to alert drivers. The speed limit on campus is 20 miles per hour. View details on scheduled traffic impacts, including a detour map. The Cascadia College Foundation is happy to share with you, ''Belonging at Cascadia'', their 2018 Report to the Community. East King County Chambers Coalition Hosts "Port Unplugged Eastside"
East King Chambers Coalition Delegates - It's official; "Port After Hours" has become "Port Unplugged Eastside" and they're a GO! Get ready for THE public policy and networking event of the summer on the Eastside. They'll have a lively interactive discussion about what the Port of Seattle is doing to foster economic development on the Eastside, followed by complimentary food and beverages. This event is directed at Coalition Chambers and their members, but local elected officials and other community leaders are welcome. This is a fantastic opportunity to enhance ties between the Port and the Eastside business community. The Adult Transition Program (ATP), serves students with intellectual and developmental disabilities ages 18-21. They are housed on the Bothell High School campus. Their students learn vocational skills and participate in volunteer internships at various businesses/companies in the community (Kenmore, Bothell, Woodinville). Their goal at the ATP is to help students get a paid job and/or gain the skills to be employed. At the ATP, they have two shifts of students meaning that they have two timeframes that their students intern and volunteer at the business/company. The times that their students usually intern would be roughly 8:30 - 10:30am and 12:30 - 2:30pm. Their next rotation would start in September 2018 when the new school year starts. To learn more contact Corbin Young or call 425-408-7187. Photography by Tyson and Tessa have completely rebuilt their website; every page is completely new. They updated all of their portfolios, changed their packaging and added more services such as weddings, boudoir and couples lifestyle.